Meet "Calamity" by Capcom Unity Devroom member kankan. This towering behemoth will go on to be featured within Legends 3 as an actual foe, though the design and concept seems to suggest it'll be a "boss Reaverbot." We'll just have to wait and see! Congratulations are in order for not only kankan but the runner-ups, as well. You can check out their designs and developer commentary over at Capcom Unity. If you didn't place in the event, fret not; there's plenty more Legends 3 events on the way! Speaking of which, the easter-egg event is still going... I gotta think up of something soon. Cloud Man: the later years. I'm not disappointed at all. That's a very good design. I'm glad we got ourselves a good winner this time. Actually, perhaps I'm a little disappointed. This is now the second boss battle that uses electricity-- the other being the OTHER contest winner. That seems a little redundant, and I'm surprised they didn't pick up on it. Then that makes me even more disappointed since mine was a similar concept (a sort of tower-shaped thing) but without electricity. I think my images were too big, though. I never did recheck my thread to see if anybody mentioned that. Very niiice. I just hope that the name changes; Calamity sounds nothing like Shurukurusu. What's with the overgrown USB logo on the right? "Nice"!? Well, almost that. This boss resembles an atomic bomb explosion... yes. Very nice! I really like this one. Wow you're right, it DOES look like a mushroom cloud. I won't be able to look at it the same way again. @anonymous about the USB: It's the pattern that's on the boss' legs. So... Does the Reaverbot use a USB? Hell, Look at that symbol. Somebody watches a lot of Miyazaki movies. 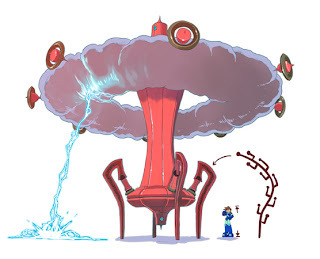 It's a Victorian armchair with a rain cloud around it. The good thing about classic MegaMan games is that you didn't need LSD to design boss robots.